These coming days, the final result of the inter-state negotiations between the Former Yugoslav Republic of Macedonia (FYROM) and Greece about the official and internationally used state’s name of the former is to be announced. 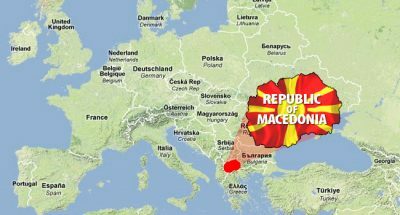 According to many unofficial sources, most probable new state’s name of FYROM is going to be the Republic of North Macedonia but other options like the Republic of Ilinden Macedonia are also circulating in mass media. Here, it is worth to remember some of the aspects of historical disputes over the “Macedonian Question”. The focal Greek accusation of Yugoslav Macedonian policy after the WWII was that the recognition of Yugoslav Macedonians as a separate ethnolinguistic nationality was a tool for the creation of a Greater Yugoslavia of a communist dictator Josip Broz Tito – a country which had to dominate in the Balkan affairs. Yugoslav post-1945 policy of the recognition of Slavo- Macedonians as a separate ethnolinguistic entity was extremely important for Athens as the creation of the separate (socialist) political unit (republic) of Macedonia within a Yugoslav federation had its irredentist implications for the territorial integrity of Greece. The crux of the matter was that Yugoslav authorities as have been ideologically backed by the inter-war Comintern’s attitude and politics that Slavo-Macedonians were a separate nation which as such deserved its own united national state claimed after 1945 that a Macedonian diaspora living outside of Yugoslavia (in Greece and Bulgaria) has to be incorporated into the “motherland” – a Yugoslav Macedonia. Therefore, socialist Yugoslavia indirectly claimed parts of Bulgaria and Greece that was seen by both Sofia and Athens as a policy of the creation of a Greater Yugoslavia at the expense of the territorial integrity of Bulgaria and Greece – two countries which never recognized the existence of any “Macedonians” on their state’s territory. Bulgaria, nevertheless, is not recognizing the existence of “Macedonians” at all, treating them as ethnolinguistic Bulgarians and henceforth claiming that a historical-geographical region of Macedonia belongs to Bulgaria. According to an American professor of political sciences, Alex N. Dragnich, Macedonia became a separate Yugoslav republic for the sake to beat Bulgarian irredentist propaganda by Yugoslav authorities but as well as in order to satisfy at least some territorial claims by Macedonian communists within the Communist Party of Yugoslavia. Nevertheless, such Macedonian policy of Yugoslav post-WWII authorities made Yugoslav Slavo-Macedonians to be one of the most satisfied Yugoslav ethnic groups. It is a matter of fact that а Slavic speaking minority in North Greece is seen by Athens either as the “Slavophone Greeks” or the “Slavic speakers of Bulgarian origin” but surely not as the “Macedonians”. 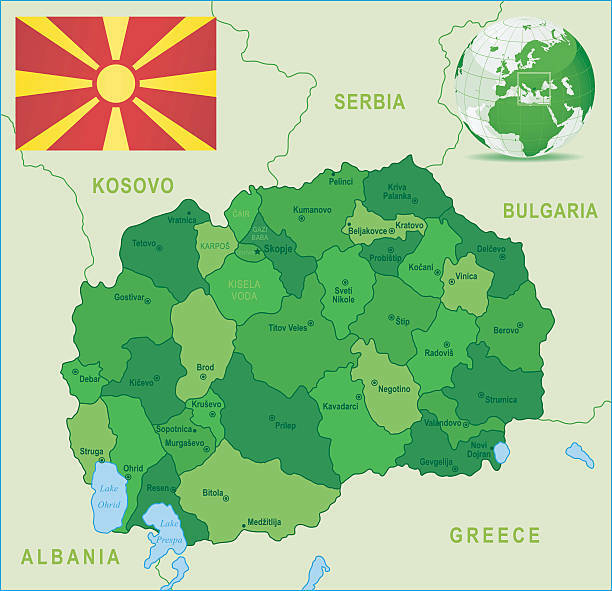 According to а Greek point of view, а term “Macedonia” can refer only to the land of North Greece and, therefore, the usе of this term for one of six Yugoslavia’s socialist republics after the WWII was a Yugoslav communist plot to annex the region of North Greece to a Greater Tito’s Yugoslavia. For the matter of better clarification of the issue, the term “Macedonia” was used to designate a separate republic as a national state of quasi-ethnolinguistic “Macedonians” when the communist leader of Yugoslavia Josip Broz Tito (1892−1980) established Macedonia as one of six Yugoslav socialist republics in 1945 and, therefore, Macedonia became a separate political-territorial entity for the first time in modern history. It was followed by the official recognition of Macedonians as an independent ethnic, linguistic and national subject, regardless to the very fact that a Macedonian national (self)identity was extremely problematic, disputed and ambivalent. It is true that the population of historical-geographical Macedonia did not always have a Macedonian national consciousness. The Slavs of Macedonia traditionally have been either without some exact ethnonational name or being self-identifying themselves as the Bulgarians. However, from the late-19th century, due to both Bulgarian and Greek political propaganda efforts, a Macedonian regional identity started to be developed but from 1945 became simply transformed into the ethnonational identity within the borders of ex-Yugoslavia. That is how today we have the “Macedonians” as an ethnolinguistic nation which is even internationally recognized as such by many political and academic authorities. 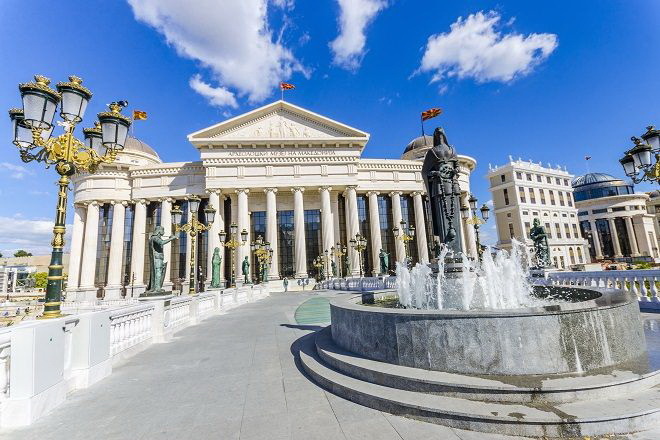 A Macedonian state is fairly young and a Macedonian nationality is recently created in comparison to other Balkan cases. A Macedonian identity is, as all other national identities, a product of imagined community and, therefore, a Macedonian national identity has been constructed in an equal way as, for instance, a Greek national identity, just rather later on. If we accept a leading Western (German) theory of the Slavic origin, the Slavs have been living since the end of the 6th century on the territory of Macedonia while the Macedonian national identity started to be developed only from the late 19th century. It is a historical fact that Slavo-Macedonian populated territories had always been part of other states like Bulgaria, Byzantine Empire, Serbia, and Ottoman Empire. Among all Yugoslavia’s provinces, Macedonia was longest occupied by Ottomans – from 1371 to 1912. After the collapse of ancient Kingdom of Macedon, Macedonia as an independent state appeared only in 1991 (like Slovenia as well) but having nothing in common with the previous one except having the same state-name. Subsequently, a modern Macedonians are historically a “stateless ethnic group” (and, therefore, not a nation from the Western point of view) like many other Balkan ethnic groups like Gypsies or Vlachs. For that reason, three Balkan national states rather divided the territory of historical-geographic Macedonia in 1913 than to support the creation of a new Balkan independent state which would not have any historical background of the existence. However, a socialist Yugoslav historiography, for the very political purposes, reinterpreted the Balkan medieval history in order to overcome a very bad reputation of Yugoslav Macedonians as the “stateless ethnic group” but not a historical nation. As a result, a (quasi) Macedonian national state was found in the Empire of Samuel which existed as a state from 976 until 1018 when it was conquered by Byzantine Emperor Basil II. The foundation for such Yugoslav and present-day Macedonian claim was a self-constructed interpretation that the subjects of Samuel’s state were the “Macedonians” regardless on historical fact that all Byzantine and other sources of the time were clearly calling this state as of Bulgarians. Even a Byzantine Emperor Basil II after the final victory over Samuel took for himself an official title of the “Killer of Bulgarians” rather than of Macedonians. Furthermore, after the occupation of the territory of the Empire of Samuel, „Bulgaria once more became an integral part of the Byzantine Empire and was divided into ‘themes’” (the Byzantine administrative provinces), but no one of them was named “Macedonia” while the biggest of them, established on the central territory of ex-Empire of Samuel, with its administrative centre in Skopje, was named as Bulgaria. It is quite understandable, henceforth, that Bulgarians see the Empire of Samuel as a part of the history of Bulgaria and Bulgarian people as their claims that Samuel was a Bulgarian and ruler of a Bulgarian state are founded on the number of historical sources of the time. Nevertheless, FYROM Macedonians base their claim on the Macedonian character of the Empire of Samuel on the fact that the capital of this state was Ohrid, a city located on present-day FYROM (on the very border with Albania), whereas the medieval Bulgarian rulers administered their state traditionally from Preslav in Bulgaria. Алекс Н. Драгнић, Титова обећана земља – Југославија, Београд: Задужбина Студеница−Чигоја штампа, 2004, 90−91. Victor Roudometof, “Nationalism and Identity Politics in the Balkans: Greece and the Macedonian Question”, Journal of Modern Greek Studies, Vol. 14, No. 2, 1996, 253−301. Nikolaos Zahariadis, “Nationalism and Small-State Foreign Policy: The Greek Response to the Macedonian Issue”, Political Science Quarterly, Vol. 109, No. 4., 1994, 647−667. Benedict Anderson, Imagined Communities: Reflections on the Origin and Spread of Nationalism, Revised edition, London: Verso, 2016. Looring M. Danforth, ”Claims to Macedonian Identity: The Macedonian Question and the Breakup of Yugoslavia”, Anthropology Today, Vol. 9, No. 4, 1993, 3−10. Historija naroda Jugoslavije, I, Zagreb, 1960, 295−301. Ivan Božić, Sima Ćirković, Milorad Ekmečić, Vladimir Dedijer, Istorija Jugoslavije, Drugo izdanje, Beograd: Prosveta, 1973, 38. Georges Castellan, History of the Balkans: From Mohammed the Conqueror to Stalin, New York: Columbia University Press, 1992, 23. Георгије Острогорски, Историја Византије, Београд: Просвета, 1969, 296−297. For the matter of illustration, for instance, Greece is so far blocking Macedonia’s joining NATO and the EU because of an on-going dispute between the FYROM and Greece. The main disputable issue is the title of “Macedonia” used in the country’s Constitution in the form of the official state-name as the Republic of Macedonia. When the ex-Yugoslav Socialist Republic of Macedonia voted for independence on September 8th, 1991 as the Republic of Macedonia that was confirmed as the official constitutional name in November 1991, Greece became with a great reason immediately reluctant of recognising the country under such official name in addition to some other significant disputable issues in regard to the independence of FYROM. A present-day territory of FYROM was formerly part of the Byzantine, Bulgarian and Serbian Empires until 1371/1395 when it became included into the Ottoman Sultanate followed by the process of Islamization. The Christian population of the land was constantly migrating from Macedonia under the Ottoman rule especially after the Austrian-Ottoman wars and uprisings against the Ottoman rule. After the 1878 Berlin Congress, Bulgaria started to work on annexation of all historical-geographic Macedonia and for that reason it was established in 1893 openly pro-Bulgarian Internal Macedonian Revolutionary Organization (the IMRO). After the Second Balkan War in 1913 Macedonian territory became partitioned between Greece, Serbia and Bulgaria. During the WWI, Macedonia was a scene of a heavy battles between the forces of the Central Powers and the Entente (the Salonika Front or the Macedonian Front). After the WWI, according to the Treaty of Neuilly, the territorial division of historical-geographical Macedonia between Serbia (now the Yugoslav state), Greece and Bulgaria was confirmed followed in the next years by a large population movement which transformed the ethnic and confessional composition of Macedonia’s population primarily due to the population exchange between Greece and Turkey after the Greco-Turkish War of 1919−1922. In the interwar period, despite continued activism by the IMRO terrorists from Bulgaria, the aim to annex the Yugoslav (Vardar) Macedonia became unfulfilled. 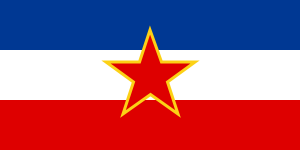 After WWII, the Vardar Macedonia became transformed into one of six Yugoslav socialist republics (the Socialist Republic of Macedonia) followed by the official recognition of the Macedonian nation, language and alphabet by the Yugoslav communist authorities – a decision which alienated Bulgaria and Greece from Yugoslavia. The proclamation of state independence of the Yugoslav portion of Macedonia under the official name the Republic of Macedonia immediately created an extremely tense relationship with the neighbouring Greece as Macedonia developed rival claims for ethnicity and statehood followed by the appropriation of the ancient Macedonian history and culture. This Greco-Macedonian rivalry became firstly epitomized in a dispute on Macedonia’s official state-name for the very reason that Greece objected to the use of the term Macedonia in any combination of the name of the state of its northern neighbour. Made a clear constitutional guarantee of having no claims to the Greek territory. Stop a hostile propaganda against Greece. Exclude the term “Macedonia” and its derivatives from a new official name of the state. The first of these three conditions was a Greek reaction to the disputable Article 49 in Macedonia’s new Constitution which declared that the Republic of Macedonia cares for the status and rights of those persons belonging to the Macedonian people in all neighbouring countries as well as the Macedonian expatriates, assisting in their cultural development, and promoting links with them. This article was interpreted by Greece as an indirect reference to the (unrecognized) Macedonian minority (i.e. “Slavophile Greeks”) in the North Greece (the Aegean Macedonia) and it was perceived as a threat to the territorial sovereignty and integrity of Greece. The EU concerning this matter supported Greece and stated in the same month that it would only recognize a new Macedonian state if it guaranteed to have no territorial claims against any neighbouring EU member state and not to engage in any act against such state, including and the use of a state-name that potentially can imply the territorial claims. Basically, only under the pressure by Brussels, the Parliament (Sobranie) in Skopje amended Macedonia’s Constitution in January 1992 and as the results, the formal constitutional guarantees were provided that the country would not interfere in the internal affairs of other states and would respect the inviolability of the international borders of any state. Macedonia’s authorities fulfilled only the minor EU requirements, hopping to be soon recognized by the same organization, but two crucial problem-issues (the state-name of Macedonia and the Article 49 in the Constitution) which caused the fundamental Greek dissatisfaction, still remained unchanged. Therefore, the EU sided with Greece and decided in June 1992 not to recognize the republic if it uses the term Macedonia in its official state title. In an exchange for the EU support on the Macedonian Question, Greece promised to ratify the Maastricht Treaty (signed in February 1993), to participate in sanctions against Serbia (its traditional ally), and to ratify the EU financial protocol with Turkey. By taking the same position as Greece, the EU demonstrated its own internal political cohesion and unity, trying at the same time to thwart the use of Greek veto right in order to protect its own national interest within the EU. A last factor that contributed to the EU support for the Greek case was a fear that the Greek Government might fall if the Republic of Macedonia would be recognized under that name. A variety of alternative names for ex-Yugoslav Socialist Republic of Macedonia were proposed after 1991 in order to solve the problem and normalize relations with Greece – a most important Macedonia’s neighbour and economic partner. It was quite clear that Greece herself would not accept any kind of state-name that includes a term “Macedonia” and therefore a variety of solutions without a term of “Macedonia” were suggested by Athens, ranging from Dardania and Paeonia (used in antiquity to name regions to the north of the ancient Macedonia) to the names of the South Slavia, the Vardar Republic, the Central Balkan Republic and the Republic of Skopje (named after Macedonia’s capital). All other name suggestions which used the designation Macedonia, mainly proposed by the Macedonian side, were in no way acceptable to Greece from political, historical and moral reasons. What Greece could accept as a kind of temporal solution was the state-name of the country with the designation Macedonia but only to make clear difference between Macedonia as a former republic of Yugoslavia and Macedonia that is a region in (the North) Greece. These solutions included names, for instance, the North Macedonia, a New Macedonia or the Slavic Republic of Macedonia. Greece even suggested that a new state of Macedonia could adopt two names: 1. One official for the external use, without mentioning designation Macedonia, and 2. One unofficial for internal use, which could include designation Macedonia. However, all these Greek solutions were rejected by the Macedonian authorities who insisted on the recognition of Macedonia’s independence exactly under the constitutional name of the Republic of Macedonia. The ex-Yugoslav Socialist Republic of Macedonia was gaining the international recognition step by step, although not in majority cases under its constitutional name as the Republic of Macedonia. By early 1993 the new state was able to become a member of the International Monetary Fund (the IMF) under the name the Former Yugoslav Republic of Macedonia (the FYROM) and by April 1993 the United Nations (the UN) also admitted Macedonia under such provisional name as a temporal compromise between the Macedonian and the Greek authorities. It was agreed that a permanent state-name of Macedonia that is going to be used in the foreign affairs had to be decided later through a process of mediation by the UN. However, the FYROM was not allowed to fly its original state flag (from 1991) at the UN headquarters as the official state emblem as Greece strongly opposed such idea. It was an insignia of the ancient Macedonians of the Macedonian Empire. It was found between two world wars in Vergina that is an ancient town on the territory of the present-day Greece but not of the FYROM. The Greek authorities is understanding the “Sun of Vergina” as a symbol which has nothing to do either with the territory of the FYROM or with the ethnic Macedonians, or better to say, with Macedonia’s Slavs. The Greeks are clear in this matter having a position that the history and culture of the ancient Macedonians does not belong to the historical and ethnic heritage of the FYROM but quite contrary, they belong to the Greek (Hellenic) inheritance. Therefore, the use of the “Sun of Vergina” by the FYROM authorities is seen by Greece as an act of falsification of history and a cultural aggression on the state territory of Greece with unpredictable political consequences in the future. That is the same as well as with the cases of naming certain institutions and public objects with the names of Philip II (national soccer stadium in Skopje) or Alexander the Great (the highway in the FYROM and the Skopje airport) or with erections of the monuments devoted to them (on the main city square in Skopje). In 1993 several states recognized Macedonia under the official state-name as the FYROM but there were also and those states who recognized the country as the Republic of Macedonia. Macedonia was recognized by six EU members followed by the United States of America (the US) and Australia by early 1994. However, the Greek Government experienced Macedonia’s recognition of independence without the final fixing the question of Macedonia’s administrative name for the external usage as her own great diplomatic and national defeat, and as a response to such situation, Athens imposed a strict trade embargo to the FYROM on February 17th, 1994 for the sake to more firmly point out its unchanged position regarding several problematic issues in dealing with its northern neighbour. The embargo had a very large, and negative, impact on Macedonia’s economy as its export earnings became reduced by 85% and its food supplies dropped by 40%. On the other side, the economic blockade was very much criticised by the international community including and the EU and, therefore, not much later became lifted in 1995, but after successful negotiations between Greece and the FYROM, when these two countries finally recognized each other and established diplomatic relations. The FYROM, as a part of a settlement package with Greece, was also forced to change the official flag of the state on which the “Sun of Vergina” was replaced with the “Macedonian Sun”. However, the negotiations between the FYROM and Greece in regard to a permanent state-name of Macedonia are still being conducted by the UN, and this problem is not solved properly up today on the way that the both sides are going to be fully satisfied. The issue arose several times concerning the FYROM possibility to join both the NATO and the EU as Greece (member state of both organizations) threatened to use a veto right in order to stop Macedonia’s admission if previously the problem of Macedonia’s state-name is not solved in the Greek favour. Talks between the FYROM and Greece are permanent up to now with some new alternative state-name proposals by both sides as, for instance, the Constitutional Republic of Macedonia, the Democratic Republic of Macedonia, the Independent Republic of Macedonia, the New Republic of Macedonia and the Republic of Upper-Macedonia. Nevertheless, the talks proved that no one of these proposals is acceptable for both parties. The FYROM proposed as a workable solution to use changed state-name only in relations to Greece, but at the same time to keep its constitutional state-name in all other international relations. However, even this proposal did not lead to a final and sincere solution as Greece insisted that a final deal must be applied internationally. The UN mediator’s compromising proposal to rename the state was as the Republic Macedonia-Skopje. Nevertheless, despite all possible efforts that were made to solve the problem, no agreement could be reached so far and, therefore, the NATO and the EU memberships of the FYROM are very problematic as one of the membership requirements is to reach agreements with Greece on all disputable political questions including and the official Macedonia’s state-name. Georges Castellan, History of the Balkans from Mohammed the Conqueror to Stalin, New York: Columbia University Press, 1992. Loring M. Danforth, “Claims to Macedonian Identity: The Macedonian Question and the Breakup of Yugoslavia”, Anthropology Today, 9 (4), 1993, 3−10. Nicolaos K. Martis, The Falsification of Macedonian History, Athens: Graphic Arts, 1983. James Pettifer (ed), The New Macedonian Question, New York: Palgrave, 2001. Hugh Poulton, The Balkans: Minorities and States in Conflict, London: Minority Rights Publications, 1994. Victor Roudometof, “Nationalism and Identity Politics in the Balkans: Greece and the Macedonian Question”, Journal of Modern Greek Studies, 14 (2), 1996, 253−301. James Pettifer (ed), The New Macedonian Question, New York: Palgrave, 2001, 15−27. The term Macedonia is of the Greek origin. This day is celebrated in the FYROM as the Independence Day. James Pettifer (ed), The New Macedonian Question, New York: Palgrave, 2001, xxv. Bulgaria never recognized separate Macedonian nationality, language and alphabet. For Bulgarians, all Macedonia’s Slavs are of the Bulgarian origin. Greece is recognizing only the existence of the Macedonian Slavs but not on its own territory where all Slavs are considered as the Slavophone Greeks [Hugh Poulton, The Balkans: Minorities and States in Conflict, London: Minority Rights Publications, 1994, 175]. Greece is a member of the EU from 1981. The Constitution’s day of adopting is November 17th, 1991 and day of entry into force November 20th, 1991. At that time it was the European Community which became next year the European Union. The territory of the Former Yugoslav Republic of Macedonia (the FYROM) is also known as the Vardar Macedonia, contrary to the Macedonian territory in Bulgaria – the Pirin Macedonia, and in Greece – the Aegean Macedonia. A geographical-historical territory of Macedonia became divided between Greece, Serbia and Bulgaria as a consequence of the Balkan Wars of 1912−1913: “…Bulgaria who had only a little piece of Macedonia in her share: the Struma Valley between Gorna Dzumaja (Blagoevgrad) and Petric with the Strumica enclave. Greece received all Macedonia south of Lake Ohrid and the coast with Thessalonika and Kavala. Serbia was given Northern Macedonia and the center up to Ohrid, Monastir (Bitola) and the Vardar” [Georges Castellan, History of the Balkans from Mohammed the Conqueror to Stalin, New York: Columbia University Press, 1992, 381]. In essence, Greece received 60%, Serbia 30% and Bulgaria 10% of the geographic-historical territory of Macedonia. A Present-day FYROM is in fact the Vardar Macedonia that became annexed by the Kingdom of Serbia in 1913 known in Titoist Yugoslavia as the Socialist Republic of Macedonia with the capital in Skopje. The Greeks are not the Slavs. The Greeks in the Aegean Macedonia are using regularly a blue flag with the “Sun of Vergina” which is also in many cases put on the state flag of Greece as a historical amblem of the North Greece. The FYROM is currently a candidate state for the EU membership together with Turkey, Serbia and Montenegro. All images are from the author. Although the September 30, 2018 name-change referendum in Macedonia, which was supposed to set that ex-Yugoslav federal republic on a path to (certain) NATO and (blithely promised but much less certain) EU membership, failed miserably, with only 36.91% of the voters turning out, well short of the 50% + 1 necessary for it to be valid – one would never know it from the reactions of its Western proponents and impatient beneficiaries. Indeed, a new term may be needed to adequately describe the reactions of the key pillars representing the reliquiae reliquiarum of the Western-led post-Cold War unipolar moment. Fake news simply doesn’t do them justice. Fake reality anyone? EU Commissioner for European Neighborhood and Enlargement Negotiations Johannes Hahn wasn’t to be outdone in his contempt for the 63% of the Macedonian “deplorables” who stayed home in order to voice their disagreement with renouncing their perceived national identity and country name (it was to become “Northern Macedonia”) in exchange for the double joy of a) becoming NATO’s cannon-fodder in its increasingly hazardous game of chicken with Russia and b) the EU’s newest debt-serfs: “Referendum in Macedonia: I congratulate those citizens who voted in today's consultative referendum and made use of their democratic freedoms. With the very significant "yes" vote, there is broad support to the #Prespa Agreement + to the country's #Euroatlantic path. I now expect all political leaders to respect this decision and take it forward with utmost responsibility and unity across party lines, in the interest of the country.” He was seconded the following day, in a joint statement, by Federica Mogherini, High Representative of the EU for Foreign Affairs and Security Policy and Vice President of the EU Commission. Understandably, as the most direct public stakeholder, NATO Secretary General Jens Stoltenberg was particularly (hyper)active. 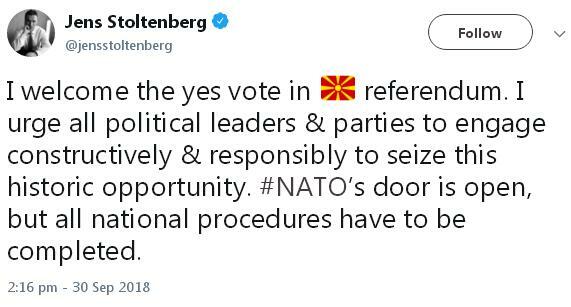 As the disappointing results began to roll in, Stoltenberg went into immediate damage control, tweeting: “I welcome the yes vote in Macedonia referendum. I urge all political leaders & parties to engage constructively & responsibly to seize this historic opportunity. #NATO’s door is open, but all national procedures have to be completed.” He reinforced his delusional missive the next day, releasing a similar statement co-signed by EU President Donald Tusk. And the day after, during a news conference, Stoltenberg even offered lightning-quick NATO accession to the unwilling Macedonians – January 2019, to be exact – if they would just be so kind as to urgently implement the very agreement that they had just so emphatically rejected. When NATO says it promotes democratic values – it means it! Speaking of Angela Merkel, she also joined her fellow Western democrats’ show of unanimous disdain for the Macedonian voters’ majority opinion, urging the country to “push ahead” with the implementation of the majority-rejected accord, citing voters’ “overwhelming support” [sic], and arguing through the mouth of her spokesman that the required 50% + 1 turnout was actually “very high,” as voter registers purportedly included many people who had long since left the country. Coincidentally (? ), the same argument was used by Greek Foreign Minister Nikos Kotzias, who opined that the “yes” votes cast in the referendum do, in fact, “represent the majority despite the low turnout because Macedonia does not have the 1.8 million voters entered into its electoral rolls but just 1.2 million since 300,000 people have left the country since the voter lists were last updated 20 years ago.” The fallacy of his reality-challenged claim is easily exposed if we just take a glance at the results of Macedonia’s last parliamentary elections (December 2016), in which voter turnout was just under 1.2 million (1,191,832 to be exact) or, officially, 66.79%. If we were to believe Kotzias and Merkel (who lodged no objections at the time), that would have meant that the turnout for the 2016 elections had been 99% – a figure that would make any totalitarian dictator blush with envy. 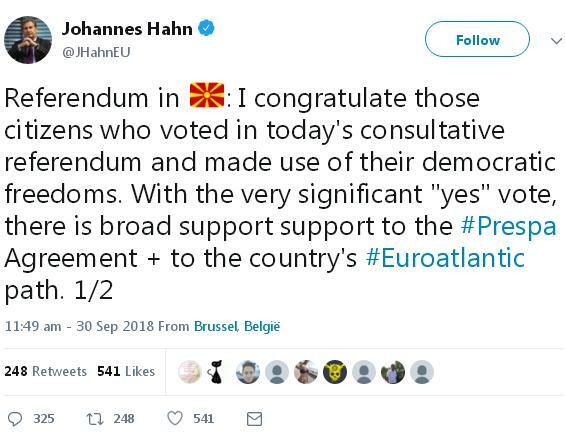 On the other hand, since those elections did produce the “desired result,” enabling the current heavily pro-NATO/EU government led by Zoran Zaev to be formed, that automatically made them “valid” in the eyes of the high priests of democracy in Brussels, Berlin, London and Washington. Needless to say, Zaev joined his Western patrons’ charade, hailing the referendum as a “democratic success,” and announcing that he would seek the Macedonian Parliament's support to amend the constitution and get the agreement with Greece ratified (according to the so-called Prespa Agreement, the Macedonian Parliament must adopt the necessary constitutional amendments by the end of 2018) so that the Greek Parliament can do the same, which would seal the deal. However, Zaev and his Albanian political partners are currently well short of the necessary two-thirds majority (reportedly, they can count on 71 deputies, or 9 short of the needed 80), and will have to call early elections if they don’t soon succeed in securing it. Still, amidst all the faux cheer and public displays of confidence of the pro-NATO/EU crowd, a palpable sense of unease hangs in the air. As a Deutsche Welle opinion piece put it, the “low voter turnout for Macedonia's referendum is a bad starting point for the country's future development.” And, according to DW in Serbian, a Frankfurter Allgemeine Zeitung commentary warned that “politicians who otherwise ceaselessly talk of democracy as a ‘special value’ should not call on the parliament in Skopje to accept the voting results.” In other words, Macedonia’s people (read – a large majority of the majority Slavic population) have “voted with their feet” and rejected the agreement, and no new parliamentary election, no matter the results, can change that unpleasant-but-immutable fact. That alone will delegitimize any Western-led effort to “manufacture consent” by ramming the agreement through the present or future Parliament – although, as we know, NATO doesn’t put too much stock in referenda anyway, while the EU is not averse to making citizens vote as many times as needed to obtain the “right” result.